25 3/8 x 22 1/2 in. With his calculated use of specific words and numbers – the elements on which most of his work is based on, Robert Indiana’s art is often very complex, introspective, intellectual and cerebral. Indiana captures the complexity of life in the enigmatic intricacies of his compositions. He is a Pop artist but, from this particular point of view, he can also be considered fully conceptual for his hermetic style, which represents a little more than a way stop from the “lack of message and superficiality” of the Pop Art movement. Although the complexity of the meaning and the aesthetic of his work is simple and timeless, mathematics or geometry are the most important elements of inspiration both for his work and his life. Indiana’s art seems to state that his reasons and themes can not be contested, since he bases his work on such logical and unbiased elements. When talking about the aspect of the works, we can not ignore the role that colors play in his compositions. They vibrate to attract each other into a reconciliation of opposite forces. Indiana likes to create endless variations of his works and early themes, experimenting with different color schemes and compositional formats to achieve a wide range of visual and emotional effects. Bright colors, often basic and primary, and the use of words, make his artworks almost monotonous to the eye, but there is plenty of significance underneath. The beauty of Indiana’s is the beauty of taking one’s time to quietly look at something that is not new, but just part of someone’s daily life. It is the beauty of balance and harmony, contemplation and knowledge, the beauty of pure reflections translated in conceptual images. 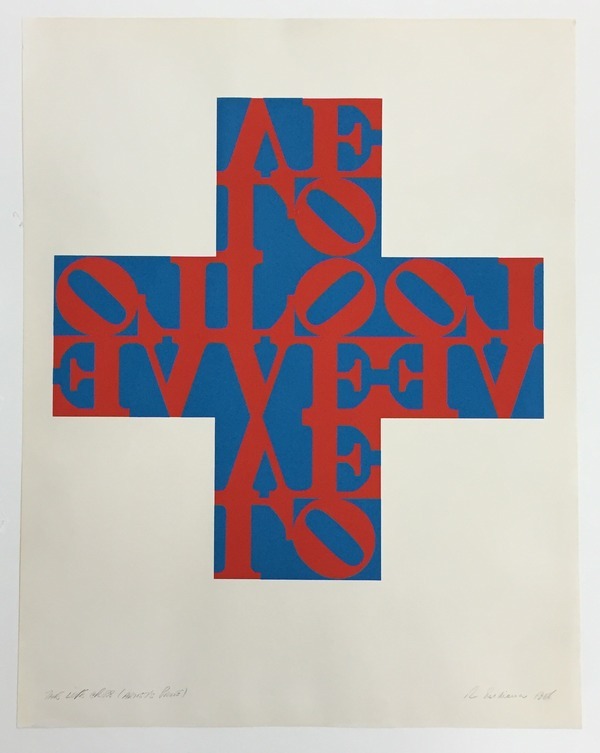 Robert Indiana’s Love Cross embodies all these concepts and features. His choice of the word “Love” recalls his memories of the motto “God is Love“, that he saw emblazoned on the Christian Science church of his youth. Containing both a universal meaning and a visually concise quality, “LOVE” provides him with the perfect synthesis of word and image. The Love Cross was made as an announcement for Indiana’s first one-man museum show at the Institute of Contemporary Art in Philadelphia, the City of Brotherly Love. The theme of Love has achieved recognition as universally familiar as the star and the cross (other two recurring elements in Indiana’s work), eventually becoming the most famous artwork by Indiana who, for this reason, has even been called “the man who invented Love“. This work reflects the artist’s involvement with the formal concerns of the Sixties abstraction, like the use of large areas of pure color, visual power of optical effects, serialization and consciousness of the edge. Indiana’s long-standing involvement with sculptural forms is clear in this cross-shaped work. A cross that is also, not by chance, symmetrical. Furthermore, since the square was his favorite symbol and a square is like a cross with extended borders, it is not difficult to imagine that this shape has been choose for a specific stylistic reason. This non-figurative composition is formed by the symbol/word LOVE, reflected in all the directions. The razor-sharp, hard-edge rigid lines help the viewer to focus not only on the red words, but also on the blue spaces between the letters, which create a visual pattern themselves. Indiana captures the complexity of life itself with simple lines, letters or numbers and flat colors. He helps us to decode life by emphasizing the most important things in it – like love. But why all these concepts are hidden underneath words and numbers? Why has he hidden it? “It is not hidden“, he says. “It is there. It has always been there. You just have not really looked at it. Look harder. Look again“. This entry was posted in WOW! and tagged art, artgallery, cross, greggshienbaumfineart, gsfineart, indiana, letters, LOVE, loveisgod, maine, miami, miamibeach, modernart, philadelphia, pop, popart, primarycolors, prints, robertindiana, wynwood by admin. Bookmark the permalink.